Every school in the UK will receive a free pack of poppy seeds to mark the Centenary of the First World War, as part of an educational initiative by The Royal British Legion aimed at helping young people understand the impact of conflict. The project has been made possible by a £100,000 grant from the Heritage Lottery Fund (HLF) and was launched today in the garden of No 10 by the Prime Minister and pupils from The Cathedral School of St Saviour and St Mary Overie, Southwark. As part of the Legion’s Centenary Poppy Campaign, this National Lottery-funded project will enable schools across the UK to plant the poppies in their school grounds as a gesture of Remembrance to commemorate the Centenary, and help pupils learn about the First World War. The poppy seeds arrived in schools at the end of last week accompanied by a booklet (download here) entitled ‘Remembrance and the Poppy: Past, Present and Future’, which highlights the poppy’s heritage, traditions and its relevance in today’s society. In addition to the seeds, the HLF grant will see 550 volunteer ‘Remembrance Ambassadors’ trained over the next year with the goal of helping young people to explore the many stories of the First World War and increase their understanding of Remembrance and the significance of the Poppy. The Ambassadors will be working with schools, community groups, religious groups, and home educator forums amongst others to provide a lasting legacy of Remembrance education and understanding through the Centenary period and beyond. This initiative forms part of the Legion’s Centenary Poppy Campaign which aims to cover the UK with poppies during the centenary period in commemoration of all those who lost their lives in the First World War. The campaign was the idea of members of the Legion’s Greenhithe and Swanscombe Branch and has been rolled out nationally with the support of partner B&Q. 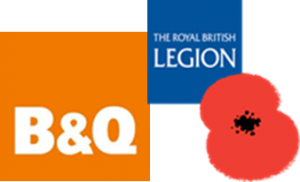 Packets of Flanders poppy seeds are available in B&Q stores nationwide with £1 from each packet being donated to the Legion.